If you’ve read up on the endocannabinoid system, you’ll know that our bodies are full of receptors that interact with cannabinoids. Cannabinoids are chemical compounds that act directly and indirectly on cannabinoid receptors to help the body maintain stability and health. Our bodies make their own cannabinoids – called endocannabinoids because they are produced internally – to work on cannabinoid receptors. By some happy coincidence of nature, cannabis and other plants also produce cannabinoids that interact with our receptors. These plant cannabinoids are known as phytocannabinoids. There are over 85 known phytocannabinoids – some sources put the count well over 100! In this article, we will tour the nine phytocannabinoids that have been most thoroughly documented, starting with the two most prominent compounds: THC and CBD. Of all the cannabinoids, THC is famous for its psychoactive effects. While those cognitive effects can have a variety of advantages or disadvantages depending on the situation, THC offers additional health properties that should not be overlooked. THC is particularly valuable for managing pain and reducing inflammation, the compound directly addressing the underlying drivers of chronic pain and inflammatory disorders. THC also has great effect in reducing nausea and vomiting, and on the flip side of that coin, stimulating appetite. Other common uses for THC include aiding sleep, managing glaucoma, reducing muscle spasms, and protecting the nervous system. The nervous system protection has made THC a useful tool in helping to manage autism, ADHD, and post-stroke symptoms. The most common side effects of THC include rapid heart rate, anxiety and paranoia, sleepiness, increased appetite, dry mouth and dry eyes, forgetfulness, dizziness, reduced blood pressure, and potentially hallucinations if you take a lot. For the most part, side effects resolve when the medicine wears off and are generally considered benign. 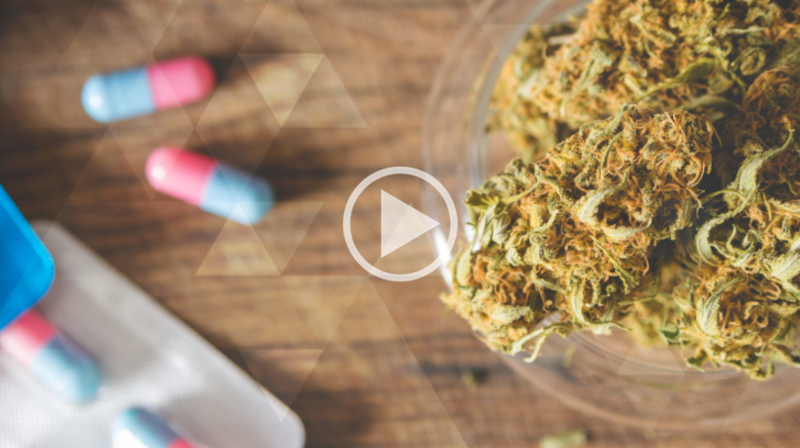 Getting your THC dosage just right can help you get the most benefit from your medicine while avoiding unwanted side effects, which typically arise when a patient has dosed over their tolerance. The side effect profile of THC is why cannabis doctors counsel their patients to start with a very low dose – around 2.5 – 5 mg of THC, and to gradually increase the dose according to how well they tolerate it. Finally, you may have noticed that some of the uses for THC are the same as some of the side effects! This is because cannabis is the ultimate personalized medicine. A negative side effect for one person may be a positive side effect for another. A classic example is a patient with cancer regaining his appetite after medicating – what a blessing for him! Similarly, an insomniac will be deeply grateful for THC’s ability to cause sleepiness after an exhausting day. While it has been around just as long as THC, CBD has only in the past few years become very popular in the medical cannabis world due to its effectiveness against epilepsy and cancer without the head high effects of THC. Though some would argue the claim that CBD is psychoactive because it promotes relaxation and anxiety relief, it is generally accepted that CBD does not cause the euphoric high that THC does. In addition to reducing or eliminating seizures and fighting the growth of tumor and cancer cells, CBD is an excellent treatment for anxiety. CBD is also an antipsychotic agent, which is why cannabis can actually be a useful tool in managing mental illness, contrary to mainstream belief. Other popular uses for CBD include reducing muscle spasms and spasms of the small intestine, and application as a pain reduction and anti-inflammatory agent. Finally, even more so than THC, CBD protects the nervous system, making it a great tool for managing dementia and Parkinson’s disease, and essential for use with THC in autism and post-stroke care. A really amazing fact about CBD is that it actually reduces undesirable effects of THC, such as inebriation, sedation, and racing heart. Specifically, in medicines with phytocannabinoid content of 4 parts or more CBD to 1 part THC (a 4:1 CBD:THC ratio or higher), CBD will dampen the head high and side effects caused by THC. Not only that, but CBD can enhance the pain-relieving, nausea-reducing, and anti-cancer effects of THC (yes – THC is quite active against cancer cells too! ).Bottom line – your medicine is better when it contains both THC and CBD! Though THC and CBD are the most well-known cannabinoids, we continue to learn more about the characteristics and applications of the other seven. #1) THCA is the acidic parent of THC found in the raw cannabis plant. When exposed to heat, sunlight, or time, the THCA in the harvested plant will convert to THC. THCA is non-psychoactive and is particularly useful for reducing nausea, reducing seizures, reducing muscle spasms, and fighting tumor and cancer cells. #2) CBDA is the acidic parent of CBD found in raw plant. CBDA converts to CBD when it is exposed to heat, sunlight, or time. Like THCA, CBDA is non-psychoactive. CBDA is also great for reducing nausea, reducing inflammation, and fighting tumor and cancer cells. #3) CBN is a breakdown product of THC. As harvested cannabis ages, THC will gradually be converted to CBN. CBN is known to be particularly useful for aiding sleep, and also good for reducing pain and muscle spasms. #4) CBGA is actually the precursor molecule that is turned into THCA and CBDA as the cannabis plant develops, so it is found only in tiny amounts in the mature plant. In the harvested plant, remaining CBGA converts to CBG with exposure to air and light. #6) CBC is also found only in tiny amounts in the cannabis plant. CBC has pain reducing, anti-inflammatory, antibiotic, antifungal, and anti-cancer effects. #7) THCV does have psychoactive properties, but much less than THC. THCV has been found to suppress appetite and can aid weight loss, and also has antiseizure effect. Which cannabinoids are right for you? Your goal should be to tailor your cannabinoid therapy to the conditions and symptoms you want to treat. As noted before, cannabis is a very personal medication, with every person requiring a different medicine composition for even the same condition. As a result, there is often much trial and error that goes into finding your ideal phytocannabinoid content. You can use the details in the cannabinoids list outlined above to help get you started in finding the best composition for your medicine. There are several different forms of chronic pain. Nerve pain may be best managed with CBD and THCA. Muscular pain often responds well to THC. A combination of THC and CBD can be useful for bone pain. Inflammatory pain can be managed with THCA or THC. Skeletal and internal muscle spasms can be relieved with CBD. THC and its breakdown product, CBN, are particularly useful for aiding sleep. And spoiler alert for the follow-up article on terpenes and flavonoids: the terpene called Myrcene is a great tool for improving sleep! CBD is the best remedy for anxiety, but at high doses can actually increase anxiety. THC can also be useful for anxiety, but only at low doses. Again, whether you’re using high CBD or high THC medicine, you should always start at a low dose and increase only gradually as needed to achieve the relief you’re seeking. How do you know which phytocannabinoids are in your medicine? Precise lab-testing is critical to optimizing one’s cannabis regimen. The only way to know the phytocannabinoid content of your medicine is to have it lab tested! Lab testing of cannabis is still underutilized and under-regulated, making it challenging to always know what it is in your medicine. It enables the informed selection of medicine specific to your condition or symptoms. It allows you to feel confident that you are getting consistent medicine from one batch to the next, which is crucial when using cannabis medicinally. The spreading legalization of cannabis and the growing interest in using cannabis medicinally will ultimately drive routine and regulated lab testing of the plant. In the meantime, look for lab-tested medicine and encourage your grower or dispensary to test their products. Do you want to learn more about cannabinoids?